"Our college decided to implement a four-year plan with Literacy Planet as an online learning platform for our Primary to Year 7 students. The concept is innovative and engaging; it provides the teachers with relevant and ongoing feedback on student performance and the flexibility to differentiate their work to accommodate their learning needs. I have found the (LiteracyPlanet) team most willing to assist us and to work with our limitations and strengths as a school. Communication has been a strong part of the relationship and I could not be happier. I fully recommend Literacy Planet and their team to any school." "I have found the program very engaging and my teachers are really using it in many different areas in class and as homework tasks. Parents request the login very early in the year. The support from Literacy Planet is also very prompt and nothing is too much trouble." "LiteracyPlanet supports students in their learning journey by enabling them to work at their own level and at a pace appropriate to them. The gamified aspects of the program and high-quality visuals engage and motivate students to do their best." "I have never in my whole teaching career come across a program that so excites and motivates children to want to learn. That then makes my job so much easier. It is most rewarding to me when I see the children with learning differences, right along the continuum, just want to work on LiteracyPlanet." "I work with students with varying degrees of needs, some that simply need a little extra help, and those who require a substantial deal of assistance. LiteracyPlanet gives students the opportunity to progress at their own level without pressure, while having fun at the same time. The program is interactive, educationally sound, sequential, colourful and inviting, and I have enjoyed being able to incorporate all of these elements into my lessons to make them more interesting. LiteracyPlanet has provided an excellent platform to engage all my students." "Every week I speak to a new principal, teacher, parent or community member who wants their child to have access to LiteracyPlanet. I have never encountered an educational program that children are so eager and willing to take part in." "We have been using LiteracyPlanet for over five years. Many schools have heard of Word Mania, but the full program is much bigger and broader. LiteracyPlanet is tablet and PC compatible and allows you to differentiate the learning without the kids seeing what is going on." "We were searching for the best interactive literacy solution to cater to the need of all individuals from Foundation to Year 8. LiteracyPlanet was the answer to all our wishes. We love how the program is customised to teach the students exactly what they need. It focuses on the areas where students require improvement, and provides support to help turn these areas into their strengths. LiteracyPlanet is a complete literacy program and by far the best investment that we have made for our college community. Thank you LiteracyPlanet. A++!!" "We were searching for an interactive literacy program that the students would benefit from and the staff would find easy to use and beneficial. We were in need of something that would cater to all of our students’ needs (English as an additional language, gifted, advanced, learning disorders and disengaged) and ALL of our students have found the program to be amazing. 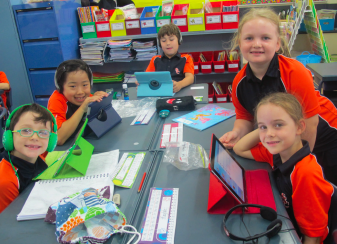 It is interactive, FUN, aligned with the Australian Curriculum, easy to use, and each and every one of our students is using the program both at school and at home. "Another significant feature that we as a school needed was ease of use and implementation for all staff. We have a spread of staff experience levels. This has proven to be a raging success; all activities are easy to find based on a topic search, all the students can be assigned the same activities across different year levels allowing differentiation to take place with a click of the mouse. Results of each completed activity are available instantly allowing teachers the ability to cater to our students learning needs instantaneously. Needless to say, we cannot speak highly enough of LiteracyPlanet and the program they offer." "My students absolutely love LiteracyPlanet. I am asked every day if they can use it!"